HOLWELL NO.14 – Holwell Iron Co., Buckminster Quarries, Lincolnshire, then Glendon Quarries, Northants. This loco was delivered new on 23rd August 1915 to the rapidly expanding Buckminster Quarries operated by Holwell Iron Co. as part of the drive for home produced ore during war time. The delivery coincided with the opening in 1916 of the High Dyke mineral branch leaving the East Coast main line near stoke tunnel and eventually serving not only Buckminster Quarries but also Sproxton, Colsterworth and Easton Mines. The loco was transferred to Glendon Quarries in 1928 and worked through a number of works visits until it became an early victim of the industry shrinkage. After a full rebuild in 1958 at Corby Works, the locomotive was sent on 17th August 1962 in full working order for scrap to Goodman Brothers in New Bradwell, Bucks. Here the loco sat, often visited by enthusiasts until recovered in the early 1980’s as part of an ill fated restoration project in Slough. 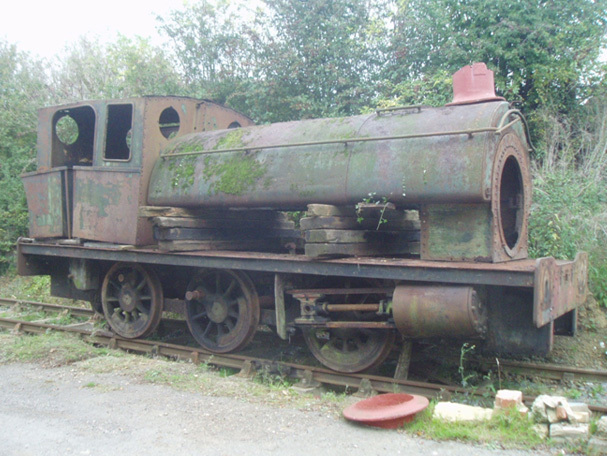 The loco was taken apart but little restoration was carried out. The locomotive returned to the East Midlands on 5th October 2007 and has now been assessed for full restoration to operational condition. In very good underlying condition we look forward to early progress. The restoration will have to address missing connecting rods as these were cut while in the scrap yard.